As I mentioned in the previous post about Little Adam’s Peak, there are a few possibilities to go for a hike in Sri Lanka. I never thought about it as a destination for hiking. While Little Adam’s Peak was a relatively short and easy tour which took about 2 hours, we were motivated to hike up a bigger mountain: Climbing Ella Rock. Ella Rock – that’s the big mountain in the background right next to us in the photo above. As you can imagine from the picture, it’s way higher and, most of all, steeper than Little Adam’s Peak. Hence we decided that climbing Ella Rock would be something to do early in the morning, when the temperature is bearable and it’s not too hot and humid. Consequently, we got up early in the next morning, packed some water, cookies, and sunscreen, and started climbing Ella Rock at 6:30 am. It’s more complicated to find your way up than it is for Little Adam’s peak. Getting a bit lost during the hike is probably part of the experience. In the following, we would like to give you a map at hand and some tips on the trail to take. As you can see on the hand drawn map (thanks to @clarkatravels), it’s quite a bit of a walk. Let me explain what to expect. Whether you start from Ella Station or somewhere after that, you should follow the railway lines towards Kital Ella Station. After crossing a big iron bridge right before Kital Ella Station you will see a little Buddha statue on the left hand side. It is placed beneath a big tree. Take the small path down there towards the river. Follow the river to the left and cross the small bridge. After the waterfall and the bridge you have to take the small path to your right. Follow it uphill, eventually leading you into the tea fields. Once you’re at the top make a slight turn to the right and follow that path a little bit down the hill towards the high grass. Go in there until the crossing. Take the left from here. You will walk towards some (farm) houses a little bit uphill and, in addition, a little shop to your left. Stay on that path as it will take you uphill while you can enjoy the view of some Eucalyptus trees. The soil, compared to other areas in Ella, is rather dry here. You will finally find a wide path that leads uphill along the ridge. 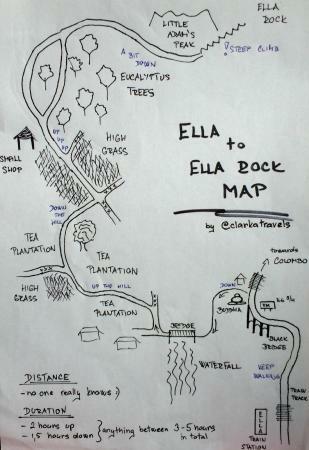 Have you been to Ella? What are you favorite spots? Let us know in the comments below.